Free simplecall app to app calls. You can record your conversation. Call through over mobile network without internet. You can manage your account on the app. 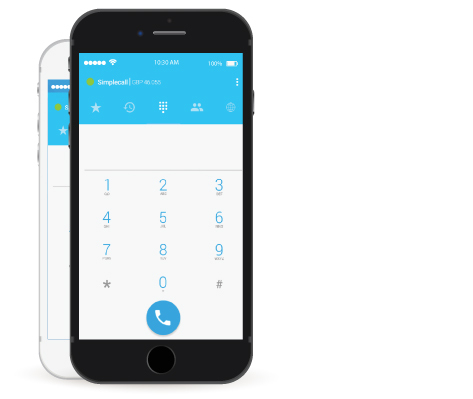 simplecall iPhone appGet more from your mobile – with our free app! If you have a smart phone, we have the app! Just download and start using our free dialler and your calls are connected over the internet. Check your app store for the simplecall app and start saving your money and your network minutes for all your international calls. Enjoy simplecall app by downloading from apple store. Step 1: Download simplecall app from app store. Step 2: Enter your mobile number to register. You will get a pin by sms to verify your mobile number. Once you enter the PIN, registration is complete. Same process applies to existing and new users. Step 3: You must give access to simplecall app to your microphone and contact list. Step 4: Your phone’s contacts list will be automatically updated to show who amongst your contacts use simplecall app. You can see the list in the tab on top of contact page listed as ‘simplecall’. You can make free calls to all simplecall app users over internet. Step 5: To call people not using simplecall app whether local or international please add call credit to your account. Note: If you have any issue, please restart/reboot your phone and try again. Make calls to any mobile or landline globally for better rates than Skype, Viber and other apps. In case you don’t have access to internet, the app will use the local access number to make your desired call. Please note- in such instance please note that your mobile service provider will either deduct from your free minutes or charge you per minute local rates depending on post-paid or pre-paid service. You can always choose the suitable local access number from your settings. Make and receive calls while abroad over internet (wifi, or SIM network) without being charged for roaming. Use DirectCall feature to create up to 100 hot number or local number mapping for all your contacts overseas. Enjoy premium quality simplecall service for A-Z destinations in the world. Get emergency credit on us when you need to make that urgent call.